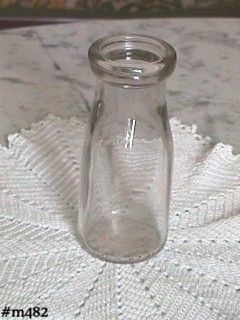 This listing has a clear glass milk bottle in half pint size! Bottle is marked on bottom: 18 46, Duraglas. It is marked on rim: MLX 498, Sealed (sorry but there are some illegible numbers). Marked on side: Half Pint, Liquid. Bottle has no chips, no cracks -- a really neat vintage item!